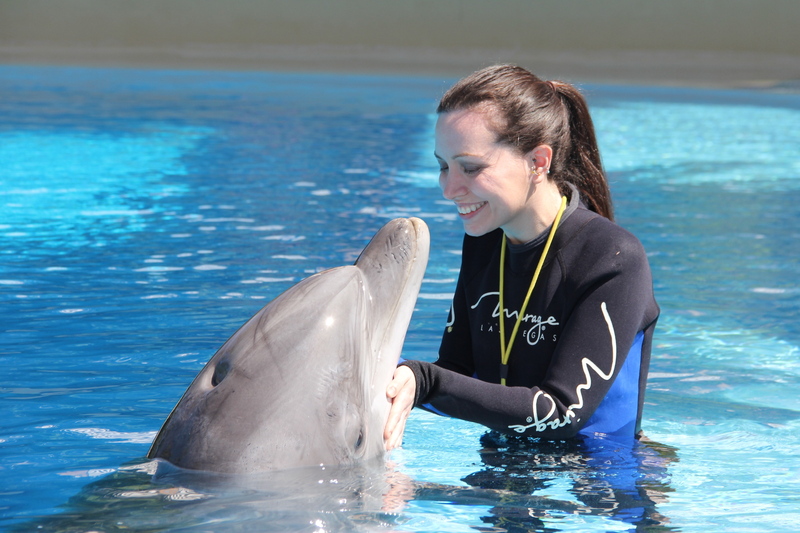 Like many of my adventures, this week did not go as planned. Originally I intended for curling to be this week’s New Thing. Yes, like the Olympics. Bridgestone Arena had an open house and curling was one of the advertised events. However, it was on “synthetic ice.” I thought this would be like grass vs astroturf and would somehow be equivalent to actual ice. It was not. It was essentially a painted wooden board and the curling “stones” had wheels on the bottom of them. We played one round (I lost) and we decided to go out in search of another New Thing. 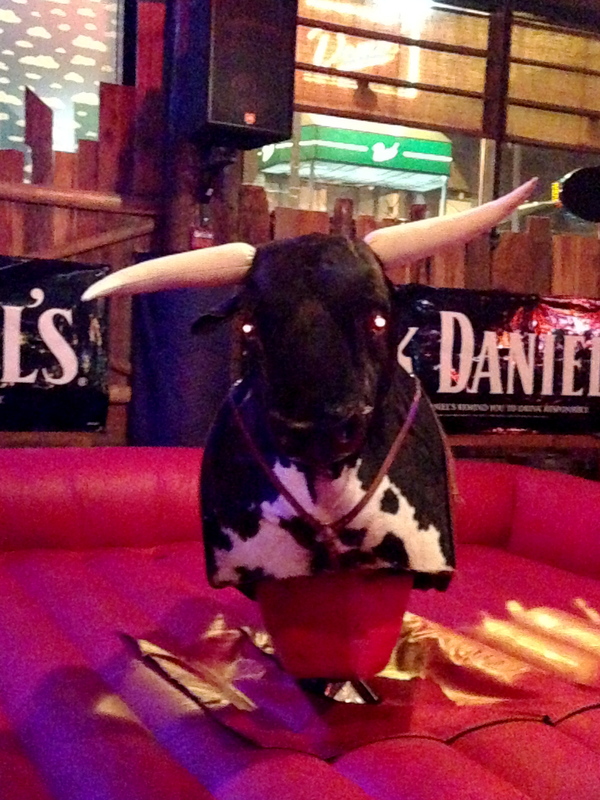 Logically, the only thing you can do when your curling plans go awry is to find a mechanical bull to ride. Fortunately, mechanical bulls are not difficult to come across in Nashville, TN. We went to a place called the Wild Beaver Saloon. Because what else would you call a bar with a mechanical bull? 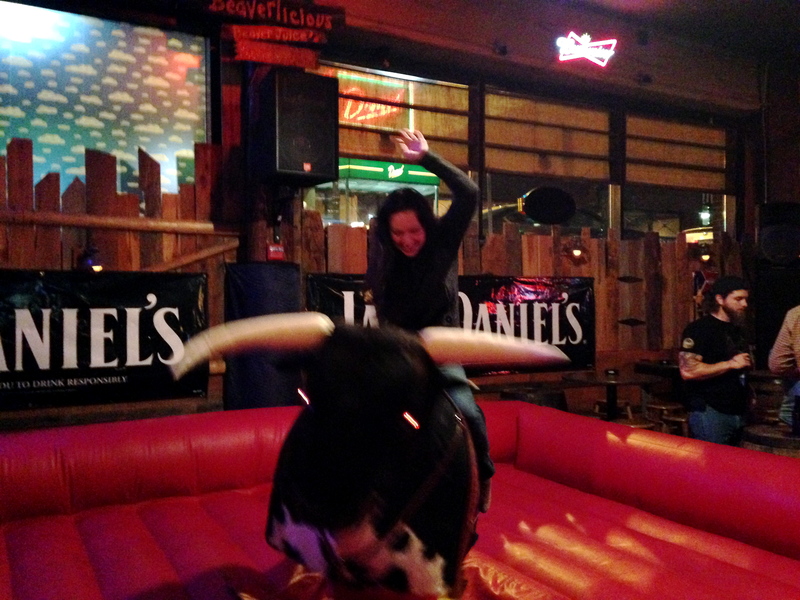 Once I got the nerve up, I paid for my bull ride and sauntered over to the bull. Being really short it was hard to climb on. Once it started moving it was difficult to keep my balance. I was determined to only use one hand, but wasn’t really certain how to ensure that I didn’t fall off. Frankly, I would not have faired any better with two hands. Eventually I was ejected from the bull and thrown on to the giant balloon cushion bellow. After my turn we stuck around and watch other people take their turn. It was evident that the bull operator treated woman and men very differently. Women would actually get a chance to ride, while men barely had a chance to get near it. He’d spin the bull around so fast they would immediately be thrown off. It was hilarious. Eventually the bull started staring me down, taunting me to go again. The second time around I was determined to stay on longer. This time I used legs to hold on as tight as possible. While this made things easier, riding a bull is a lot harder than it looks. It seems like I’m not moving very fast, but it takes a lot of work to fall off. The slightest movements really throw off your balance. The next day I woke up with an 8-inch bruise on my thigh and felt as though I had a tough workout the day before. I don’t think mechanical bull riding will be something I try again, but I’m glad I’m able to cross it off the list.